Doha (AFP) - At the very same time as Syria's football "miracle" unfolded this week, two rather sorrier World Cup tales were played out. In a virtually empty, expensively-refurbished 2022 World Cup venue, Khalifa International, two of football's most ambitious nations, Qatar and China, confirmed their exits from the 2018 tournament to almost global indifference. 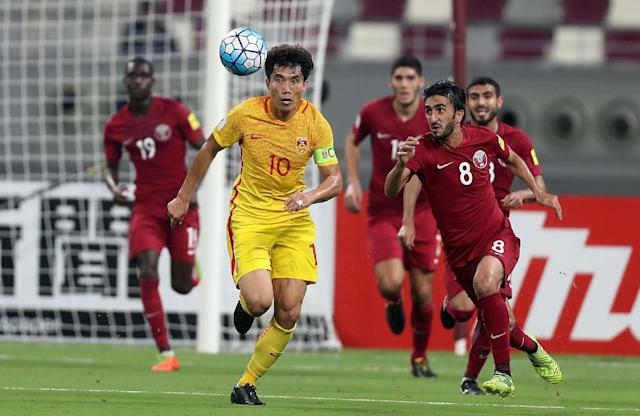 China won 2-1 but their own longed-for miracle to qualify for Russia next year was ended by Syria's heroics and a goalless draw between Uzbekistan and South Korea. There was at least some solace for Marcello Lippi's China in coming within a point of making the play-offs after a desperate start to the qualifications. Qatar's campaign, by contrast, ended in disarray. The country was desperate to qualify for Russia to vindicate FIFA's controversial decision to give the 2022 tournament to the Gulf state. Instead Qatar becomes the first country to host the World Cup without ever before playing in a finals since Italy in 1934. The only comfort from that is Italy won that tournament. Qatar's elimination will be enjoyed by its many critics in the West who claim the emirate should never have been given the chance to host the World Cup, pointing to a lack of footballing pedigree as well as corruption and labour abuse claims. And latterly, it will also be savoured by some regionally as Qatar contends with the ongoing political crisis with its Gulf neighbours. Embarrassing it may be, but analysts contend that failing to qualify is not fatal for the 2022 World Cup, on which Qatar is spending $500 million a week. "Having never qualified for a World Cup before, I don't think Qatar should have ever made the claim that it was a genuine footballing nation," Christopher Davidson, a Middle East expert at Britain's Durham University, told AFP. "That said, plenty of well-regarded footballing nations often fail to qualify for World Cups, so this works both ways." And despite making unwanted history, Simon Chadwick, professor of sports enterprise at the UK's Salford University, argues the failure may soon be forgotten. "The majority of countries in world football fail every single year," he said. "Failure is quickly forgotten in football, which has an incredibly short-termist culture." There are also more ways to judge than the success of the national team, argues Chadwick. "It is also about the number of fans, amount of consumption, provision of financial support, origins of commercial partners, source of political influence and so forth," he told AFP. On the pitch though, it was genuinely a sorry tale. Qatar managed just two victories in 10 games, one fewer win than the number of coaches they appointed for those matches. Their most notable result, a 3-2 win against South Korea in June, saw the Qatar Football Association fined some $50,000 after players broke FIFA rules against political statements by wearing T-shirts of the country's Emir as the Gulf diplomatic crisis erupted. Immediately afterwards coach Jorge Fossati surprised everyone, including the QFA, by resigning as "discussions" between him and the federation over whether to use more home-grown rather than "naturalised" players, festered. He was replaced by Spaniard Felix Sanchez, who has put his faith in the next generation of players. "We have a lot of young players to prepare for major tournaments leading to the 2022 World Cup," said Sanchez after the China defeat. Whether he will be there, as his appointment covered only the remaining World Cup fixtures, is unclear. And without a World Cup fixture now for five years, Qatar is desperate for meaningful matches. Regional politics may scupper that in the short term. Serious doubts hang over whether the Gulf Cup of Nations, scheduled to be played in Qatar in December and January, will take place. Three teams expected to take part -- Saudi Arabia, United Arab Emirates and Bahrain -- are those leading the boycott of Qatar. However, one outcome of the World Cup exit may be more eye-catching spending from Qatari-owned PSG. "If anything, the national team's elimination underlines the necessity of Qatar's international soccer soft power approach," added Davidson. "It demonstrates that Qatar needs to spend very heavily in foreign leagues if it wants to put itself on the map and then stay on the map."